I've been thinking about how I'm going to use my greenhouse lately. 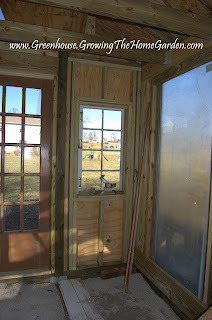 There's just enough complete on the greenhouse construction to tantalize my imagination and since people use greenhouse in so many ways that the options are virtually limitless. I don't grow orchids or many tropical plants which means the greenhouse won't be used for them. It's not ready to use yet so seed starting this year isn't an option. Some people like to grow vegetables in their greenhouses to keep fresh veggies growing year round. I like that idea and it might be something to experiment with in the fall assuming I can put together some sort of heating system. Spinach, lettuce and chard might do fine without heat but any summer loving vegetables just won't work. For right now though I'm planning to use it for two things: 1) A Storage Shed and 2) To Propagate plants. Inside the greenhouse shed I've designated a corner as the shed section. Since the overall size of the structure is 12'x16' the shed corner will be about 6'x 8'. If I need more or less space I can use the overhead rafters to hang tools and equipment. The important thing is to house my riding and push mowers. The weed eater and other various tools will find homes there as well. I've collected all kinds of used pots and containers over the last couple years from friends and family and they will get homes inside the greenhouse. Hopefully many of them will be used for plants that I propagate. I really enjoy the thrill of getting new plants for next to nothing through plant propagation. I've detailed many of the plants I've propagated already but I'm hoping that I can increase the number and types of cuttings. Maybe eventually I can put together a small business selling plants (which incidentally is my dream job.) I have two areas inside the greenhouse that I can use for propagation. The long wall (top left picture) is the larger of the two areas and is where I'm planning on building shelves to add more potting and planting space. This area is about 16'x6'. There is a small area on the opposite side that receives morning sunlight and afternoon shade. It will be where I put more shade tolerant/loving plants like hostas and heucheras. The location of my greenhouse is pretty good for spring-summer cuttings. It has filtered light coming in through the trees which should be ideal for propagating plants. 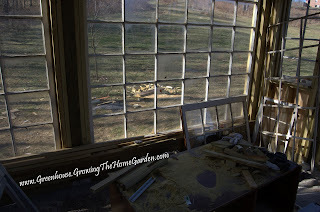 I still have a ways to go before I can do much inside the greenhouse shed. If only the weather would brighten up and dry out!